Tomato seeds can last years if taken care of properly. Other seed can last a long time too. However, you want to test germinate them every once and while to make sure they are still viable. This will save you both money and time. You won't need to buy seed if your old seed are good and you won't sit around waiting for bad seeds to germinate. You can do these for any older seeds you want to check. I am starting the 2016 Community Plot Series off with building beds. I show you how to build and fill a 4 x 4 raised bed. I talk about the benefits of raised beds and why I choose them for that part of the garden. I also use principles in 'Back to Eden Gardening' which included using fresh wood chips and layers of compost and manure. Basically following Nature's direction. How to Collect Seeds from Flowers and Herbs: A Simple Way to Save Money! A Simple Way to Save Money! Basically just go and get them! I use Snapdrgaons and Chives as examples for collecting flower and herb seeds. It is easy to do and it saves money. Simply collect the dried flower heads. Save the seeds in envelopes or small containers and they can last for years. Just keep them in call dark place. Fall is a great time for seed collecting. You can use them next spring as I will, in my seed starting trays. Planting Fall Garlic Quickly and Easily - Plant a Few Cloves! Garlic can take the cold and is often planted in the Fall in many areas. It will over-winter freezes and snow nicely. I show you how I plant common store bought garlic in Maryland Zone 7. Typically I get it in the ground in mid October. However, if the ground can be worked and you can plant it below your freeze level... you can still plant it. There are many ways to prepare your vegetable garden beds in the fall so they are ready for the spring. This is how I prepares some of my beds, so come fall, I just turn the ground and plant. I prepared this with organic fertilizers and I use a newspaper layer for weed block. Like I said, come spring I just turn it and plant it. I am starting the 2016 gardening season off with this video. This is how you can use hardwood ash in your garden. My approach is very limited use of hardwood ash in the fall. This gives your garden or more specifically the soil organisms time to break the ash down. Hardwood ash provides potassium, calcium, magnesium and trace elements to your vegetable gardens. Using 100% Cold Pressed Neem Oil with Azadirachtin in Your Garden: Stop Chewing Insects! I have been using Neem Oil for several years. It is outstanding for stopping chewing insects in your vegetable garden. It is 100% natural as it pressed from the seeds of the Neem tree. If you look up Neem Oil use in India, you will find it has been used for well over a 1000 years. I sell 100% Cold Pressed Neem Oil with all its components on my blog. You are certainly welcome to purchase it from me but no matter from where you purchase it.... make sure it is 100% cold pressed with the component azadirachtin. That is what kills chewing insects. That is what you are paying for as an insect killer. Sadly, in the States they sell a filtered product of Neem and all you get is the oil. All the key components are gone. An oil in itself does smother and kill insects but you can use any oil for that. If you buy Neem Oil make sure it is not filtered. This video will explain the products that ARE NOT useful and yet fool you buy saying Neem Oil. Neem oil changed the way I can grow kales, cabbage, cauliflower, Brussels Sprouts, collards and the related crops. Neem oil with Azadirachtin coats the leaves, the insects chew and ingest it and in several days they die. It will not harm non chewing insects if they are not sprayed by it. There are several ways to mix the spray. You can watch my videos but because soaps and climates vary... ALWAYS test spray new sprays on leaves of your different vegetables. You should wait 48 hours to see if the spray damages the leaves of the different plants. If there is not damage spray away. Here are some testimonials from people that have used 100% Cold Pressed Neem Oil and/or purchased what I sell. Just make sure you buy 100% cold pressed Neem Oil with all its components. you want the Azadiracthin. Cucumber Gardening Tips: Care, Feeding, Trellising and Transplants! Come mid July from heat, bugs, diseases or all three... your cucumbers can get beat up. A lot of time, here in Maryland Zone 7, I get great production from my cucumbers from late June until the end of July. But then the plants just get beat down. That leads me to my first and most under utilized tip. TIP ONE: Start some new cucumber transplants mid July. Select a fast maturing variety and start the seeds outdoors in 8 ounce cups. Replace your old beat up plants with 2 week old transplants come the end of July. They should be up producing by the end of August. Your cucumbers might be a bit weathered and worn. You can use Epsom Salt as a way to green them up and it is probably a good idea to give the a nice large liquid feeding with a balanced liquid fertilizer that covers N-P-K and micro-nutrients. This is true for both container and ground planted cucumbers. If you are growing cucumbers in containers, you should be feeding them at least 2x's a month when they are producing. TIP TWO: Give them some Epsom Salt and a liquid fertilizer that is well balanced. Sometimes you get lots of flowers and little cucumbers that seem to turn brown and die after growing. That is because the female flower with the tiny cucumber wasn't fertilized. You can actually hand pollinate cucumbers to increase production. TIP THREE: Learn the difference between male and female cucumber flowers and try your hand at hand pollination. This will help you get more mature cucumbers. Cucumbers can take up a lot of space in the garden. Trellising cucumbers is a great way to save space and better manage pests and disease. It is a lot easy to spray cucumbers that are growing vertically. You are able to get both sides of the leaves much more easily. TIP FOUR: Grow your cucumbers vertically. It makes care much easier! Cucumbers are often attacked by cucumber beetles and other insects for that I use Neem Oil and soap to make a spray. They also can get powdery mildew. For that I use a baking soda spray. Spraying before problems arise is key. Know when problems show up in your garden. Write down the dates and start spraying 2 weeks before they arrive. AND.... ALWAYS test spray anytime you make a spray, it is important to test a few leaves with the spray and wait 48 hours to see if any damage occurs. TIP FIVE: Start spraying 2 weeks before problems arise in your garden. I use Neem Oil for insects and baking soda at times as an anti-fungal. wont be shipped until July 14th & 15th. My Most Recently Published Video. Follow My Garden's Growth at My New Community Plot: See Everything I Do Over the Year - From Weeding, To Soil Preparation, Planting, Tending, Harvesting and A Lot More! This year I finally got my community garden plot. I inherited and over-grown plot covered in weeds and wire grass. The fence needed to be replaced and it was in need of lot care and repair. But it is mine! The first 6 episodes show you how I took it from its neglected over-grown 20-25 foot plot turned into something I am really proud of. If you don't have room or land... you might want to look for community garden plots in your area. Check out the videos for more information and watch me build and grow my community garden. I finally got my 20 x 25 foot community garden plot after a long wait. I will be doing a season long series on how I manage the plot, plant, tend and deal with pests. Some of the space will be used by kids for their first garden and I will show off some of other garden plots in the community. This episode covers quick fencing, vinegar weed & brush killing and putting down weed block. The grunt work. Filling the Beds Cheaply, Planting and a New Gardener! I finally got my 20 x 25 foot community garden plot after a long wait. In episode 2, I show you how to cheaply fill your beds and some of the problems I am encountering. My goal is not to have to spend a lot of money to fill the beds this year. The plot has cost about $225 so far to get it in shape. And Leena, a new gardener, starts getting her plot in shape too. She is three! This is Episode 3 for my community garden plot. I will be doing a season long series on how I manage the plot, plant, tend and deal with pests. The 12 beds are just about prepared. I show you how to use containers to make raised beds. There are 100's of ways to get a garden ready for vegetables. I have covered about 8 ways to prepare the beds in the last 2 episodes. I also show you the beginning design of my container water system that uses a drip hose and eventually a rain barrel. This is Episode 4 for my community garden plot. I will be doing a season long series on how I manage the plot, plant, tend and deal with pests. The containers were planted with peppers and tomatoes. I started some 7 gallon grow bags with a shredded leaf mix for the containers soil. I am experimenting with a drip systems and Leena waters her garden and enjoys a wheelbarrow ride. This is Episode 5 on my community garden plot. I will be doing a season long series on how I manage the plot, plant, tend and deal with pests. Some quick tips on making it easier moving a hose through garden, staking determinate tomatoes, trellis types, and I raise my fence by two feet. The member told me deer can jump 4 foot fences. And a general updated on the growth. This is Episode 6 on my community garden plot. I will be doing a season long series on how I manage the plot, plant, tend and deal with pests. I show you nutrient lacking tomatoes, talk about nutrients, how to use Epsom Salt, flea beetles on eggplants and the progress of my plot. I also show you white patches on zucchini leaves... it is perfectly normal. Episode 7 will be put out this week. That episode and future episodes can be found on my YouTube Channel! There are several reasons you may prune peppers. One reason is to develop stronger sturdier stems. This helps plants manage high wind areas and better support heavy crops of peppers. Removing the main growing tip will also create more side-shoot growth in 98% of pepper varieties. I found a few that don't seem to like pruning like 'Banana' peppers. This will create a bushier plant that will branch out and flower more. The more flowers, the greater the yield of peppers. Pruning ultimately lets you make a stronger plant that produces more. I will be doing an ongoing series based on the peppers I am pruning. I will be using control groups when available. Here is what my original pruned peppers look like, about 1 month later after their initial pruning. They are compared to un-pruned peppers of the same variety. Here is the original pruning video if you would like to see how it is done. Pruning can be done many many many ways. This is just one way that I prefer. Removing the main growing tip of your pepper plants will produce stronger stockier plants and increase the yield of each plant. You end up with a lot more side shoot growth which means more flowers and peppers. You don't want your transplants flowering indoors. Prune them. Let them work on stem strength and side shoot production while inside. Typically, peppers are started 8-10 weeks indoors before they go outside into the garden. You can start them a lot sooner and prune them. You will have stronger plants that will bring you greater yields. When you start them earlier as I did, about 16 weeks before they will go outside, you need to prune them and remove the flowers. Everything You Need to Know About Starting Peas Indoors: It Can Be Done! Peas are cool weather crops and need to be planted fairly early here in Maryland Zone 7. They prefer well drained soil and soil temperature that is 40 degrees or more. They do best when day temperatures don't get past 70ish degrees. So... I try and get mine outdoors in March. As of today, tomorrow will be March 1st and the ground is covered in snow and frozen. Losing most of March by waiting to plant peas directly in the ground, when the soil is ready, will really reduce my crop. You can easily start peas indoors in peat pots or styro-foam cups. This will give you a 2-4 week jump on the season depending on the variety of peas you start. The video shows you how I seed start them and when they are ready to be moved into larger containers or outdoors. Remember plants that are started inside, need to be gradually introduced to the sun and temperatures. This is called hardening-off. Peat pots work really well because you can plant the whole pot and not disturb the root systems. Peas will have strong long roots. If grown in the plastic cells, the will grow out the holes in the cell bottom. They have to be pulled back through that hole and often the roots get damaged. An eight ounce styro-foam cup provides enough room for the roots to grow. Just pop out the dirt plug from the cup and plant. With the peat pots, the pot and plant go straight into containers or ground. I show you how to put them in a 5 gallon container. The process is essentially the same for putting them in the ground. You can plant them in a row if they are going into earth beds. There are many variations of the three categories or types. You can get variations that give you white or purple flowers, purple pods, wrinkled peas or dwarf varieties. Maturity time can also vary by a few weeks. However, many gardeners want to know: Did I get the flat peas for stir-fry? Are these edible pods? Why do some say Snow Sugar or Sugar Snap? What are shelling peas? This video will explain the main types you would want to plant and grow in the garden. I hope this video helps you when you select your seeds. Remembers peas like to planted when it is cool, the ground is about 40 degrees and they hate soggy soil! Calcium Nitrate is a water soluble form of Calcium (Ca) that you can make a spray with and spray on your plants to get them calcium, to help stop or prevent blossom end-rot. You should always make sure your soil has lime/calcium, but additional spraying can give your tomatoes the Ca they need if Blossom End-Rot appears. Always test spray your plants before covering a plant with any new spray. Wait 48 hours after testing a few leaves and if there is no damage, spray the plant. or 1 teaspoon per quart of water. About 350 grams of calcium nitrate. The recipe is on the label and can be found on-line. Always test spray this product on your plants. This package of 350 grams will make about 19 gallons or 76 quarts of calcium nitrate solution 1 quart will cost about $8-$9 in a store when you by pre-made spray, You can save over $600 by making your own as needed I am only shipping in United States right now. You can purchase my Calcium Nitrate Package through Paypal. These cages can be built in 15 minutes. They will allow you to get your tomatoes into the garden a lot earlier. It works. I use a few every year and am the first in the area with red tomatoes. It creates a nice micro-climate that warms the soil for great root growth and it protects the tomato transplant. They act as a wind break and keep the plant from cooling from winds. They also allow transplants time to get used to the elements without becoming over-stressed. It makes a mini shelter for them. The plant is better protected but what is equally as important is the soil warms and stay in the 50+ degree range. The warm roots translates into plant growth. Cold roots keep a plant from growing. They will collect the solar heat of the day. A sunny day in the 40's can easily heat the cage into the 80's. At night I recommend putting a plate on top, a few hours before the sun sets, so it stores up some heat. It is also important to remove it on sunny days in the morning. The inside of the cages can over heat on sunny days. I will be doing a new video that adds in a black painted milk jug at the bottom like in the picture. The milk jug is filled with water and it will radiate heat at night to help maintain a bit more warmth. They day time heat is quickly loss when the sun goes down. Maintaining warmer night temperatures helps prevent the tomato from going dormant so to speak. In the event of a light frost a cage with a sealed top will give your tomato a few degrees of frost protection. The milk jug with it will help out even more! The tomato can grow and get plenty of light. Some early systems filter out light and plants can get spindly or the aren't high enough and plants out grow them before the right temperatures arrive. They grow out of their protection. You can also lay a piece of black plastic on the ground with a hole in the middle for the tomato. The cage can go on the plastic and it will warm the soil. A tomato also needs warm roots to start growing or it will sit and wait for the right temperature. This video shows you how to plant and start the seeds, talks about germination, feeding, when to thin them and how to transplant them into larger cups. It covers everything you need to know for starting the seeds of the Brassica Family. In this case, kohlrabi, kale, broccoli, Brussels sprouts and cabbages. The process is the same for all of them. These vegetables love the cool weather and can be some of the first plants into your garden, especially as transplants. They can take light frost and even freeze. The cool weather makes them sweeter! They are very easy to grow and vary in maturity dates. Kales will grow all season long. I live in Maryland zone 7, my kale survives the winter. On the 2nd year it returns it forms small buds and flowers. The buds and flowers are delicious! Years ago Google had KNOLs. It was were you could write articles. I did that for a while until Google closed it. I kept the old articles here and will be updating them for 2015. This was how I set up my current grow light closet back in 2012. This was before all the videos. I used to just write articles with pictures. Growing vegetables and flowers indoors is not difficult. You need space and light. You can create your own growing station by using standard fluorescent fixtures purchased at any home improvement store. You can use the fluorescent bulbs sold in these stores. There is no need to pay top dollar for grow lights systems or special grow light bulbs. For under $75 (in lights and fixtures), you can get a station set up in a closet or even on a shelf. Every gardener desires more space. I recently had my basement finished, did the drywall myself, and had a grow-light closet built. It was under my stairs before construction and I had quite a bit of room. Though demoted to a closet, I love it. I needed to build a third level of lights. This article (an old KNOL) shows you how to build a basic and highly functional grow station. It is very easy to build. This is how my closet looked before I started the third level of lights. There are two levels below it. I use foil to reflect light back into the seed trays. The third level of lights is going into that empty space. You need to select a space and build a shelf like I did, buy shelf or put in an old table. Once you identify the location of you grow station you need a place where your seed trays will sit. Anything works. People even buy the plastic shelving units at home improvement centers for their grow stations. They provide plenty of shelves for hanging lights and a nice surface to hold your seed flats. I added four boards as seen below. The two boards in the middle will support lights and the others will support the drywall surface top. Now drywall isn't the best choice because it can get water damaged if there is a whole lot of excess water. Why did I use it? I have a lot left over from finishing my basement. The timbers are left over too. How you space the levels is up to you. You want enough space to work. If you use a shelving unit, most of the shelves have holes in them. You can hang the light using those holes. In this space I will need two fluorescent fixtures to light the whole area. If you are building your station on a shelving unit or on a table that is 1/2 the size of the space I am using, you will only need to hang one fluorescent fixture. If you use a shelving unit, you will attach your lights to the shelf above it. That is the basic fixture I use. It is from a home improvement center. The fixture does not come with light tubes and it is inexpensive. I purchased the brightest basic fluorescent tubes in the same store. They also weren't expensive and I DON'T recommend buying tubes that are for growing plants. You know why? You just get charged double or triple for the same tubes. Just buy the brightest Lumen and Kelvin outputs on the fluorescent tube out there. I've done it that way for years. I have only replaced two tubes so far. One fixture goes on the back middle timber. It is supported by tomato jute/string. I put loops on the end of the jute and can easily adjust the light height by attaching different loop levels to the hook in the fixture. Most of the lights come with chains and hooks. I seemed to have misplaced mine. You will be able to move your fixture up and down as the plants grow. Here is a basic distance for the light to the plants. You typically want about 2 inches between the plant and the bulb based on my experience if you can continually manage it. But this does vary, based on the type of bulb you use. You can get away with more distance from bulb to plant as the plant gets larger and stronger. The next light goes in the front middle timber. This space requires two lights. The variance in brightness is due some to the bulbs but mostly to me using or not using the flash on my camera. I am a gardener, not a photographer. I put foil down with the reflective side up. My seed trays will get pushed back and the area in foil won't be fully covered by the trays. I want the light to be bounced up and around. You can also see a foil flap way in the back and on the right side. Anywhere the light goes, redirect it back to the plants with foil. Please use the reflective side. There are two fixtures in the picture below. You just can't see the one behind it. I also have a front flap of foil attached. The growing area is now nicely wrapped in foil, mostly for maximizing light but it does help with warmth a bit too. You can see how bright the seed growing station is. It provides plenty of light without the expensive cost of grow stations. The upgraded closet. I put a new shelf on the top too, to store my supplies. You can see different stages of plant growth. The bottom has seedlings in cups. The 2nd level has trays with seedling up and about and the third level is holding my tomatoes I just started a few days ago. You can start all your vegetable and flowers seeds indoors by building a basic system like this. It works. You don't need anything fancy. I also recommend getting some light timers. It saves you the hassle of having to turn the station on and off. I typically set my timers for 14-16 hours (I used to say 10-12 hours). You can set it and forget it. You will also need some extension cords. The fluorescent lights come with 3 prongs on their plugs. You need adapters or cords the accommodate the plugs. Good Luck! A video that explains lighting and why Lumens and Kelvin are important. 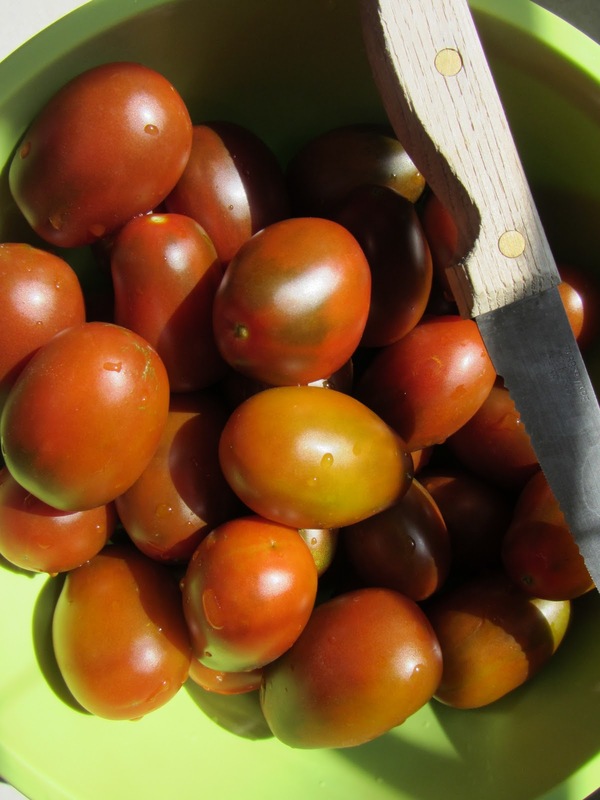 Ten Things About Tomatoes for 2015: Tips for Tomato Success! There are two types of tomato plants. A tomato plant is either a determinate plant or indeterminate plant. A determinate tomato grows to a set height and stops growing. The fruits mature all at once or relatively close in time and the plant dies shortly after the final fruits mature. This determinate type of tomato is great for getting the first round of tomatoes from your garden (as they mature quickly) and they do well in containers. You might be able to plant two rounds of determinate tomatoes in your gardening zone. You can often plant them in May and again in July. The indeterminate tomato continues to grow and grow until frost. It sets fruit throughout the season. Only frost or disease will stop an indeterminate tomato from producing. Think of it this way, a determinate tomato grows to a predetermined size. Indeteriminate tomatoes often need to be staked and pruned. Determinate tomatoes need little to no pruning. A tomato is a vine. When you plant them, you want to plant them deep in the ground. When you buy a tomato transplant they should be 6 to 10 inches tall (or so). You should plant the tomato to at least a third or half of its height. If the tomato is 12 inches tall then plant 4-6 inches of the plant stem below ground. Why? Because a tomato is a vine that will set roots from any part of the stem, if the stem is below the ground or touching the soil. A strong deep root system leads to a stronger plant. Tomato Thing Three: Planting a Container? The determinate tomato grows to a set height. This makes them the best bet to survive in a pot or container. I recommend buying a very large container (5 gallons at least). A smaller container can work, but you really have to keep an eye on watering. If you let the plant dry out, it really messes up the fruit. The fruit will crack. If you over water and then let it dry out and repeat, you will probably see your tomatoes rot from the bottom. This is known as blossom end rot. It is a calcium deficiency and occurs when the roots aren't watered properly and therefore can't absorb nutrients properly. An indeterminate tomato may just grow too large for containers. I grow indeterminates in containers and found you have to water them daily and feed them well, every 10-14 days or problems develop. Indeterminate (determinates too but they naturally die off) tomatoes needs to have air circulating through and around the plant. Poor air circulation leads to disease. As your tomato grows, you should pinch off the leaves nearest to the ground. I try and keep 12 inches between the ground and the the first leaves (sometimes more). Now you can't do this all at once but as the plant grows taller, you should prune the bottom leaves to about 12 inches from the ground, slowly over time. This will allow air to circulate below the plant and make it harder for disease/spores to splash up on the plant. You will also need to prune suckers/branches from the upper part of the plant. That sometimes means taking off large pieces of your plant. Painful to do but necessary. Air also needs to circulate through the plant. Air circulation helps keep humid air from sitting around the plant and it helps to dry the plant leaves after watering or a good rain. In the end it really helps prevent diseases. Tomatoes are vines. If you let them sprawl on the ground you will see them root from the vine that touches the ground. You will see additional vines growing all over the place and end up with a mess. Sure you will get tomatoes (maybe a lot) but you will also increase the chances of your tomatoes getting diseases like blights. A 6-foot stake is the best way to train your tomatoes to grow upwards and stay off the ground. It helps you manage the plant's size and prevent diseases. You know what happens if you over fertilize a tomato? You get a very happy large green plant with less fruit. I fertilize when the plant is planted and when the plant has been growing about 6-8 weeks or when it sets its first fruit with a side dress (scattering fertilizer on soil). This is late June/early July in my area for indeterminate varieties and early June for determinate varieties. I will side dress them again in August as needed. They also get a drink of liquie fertilizer in June, July and August. I might use a synthetic product like Miracle Gro or fish emulsion which is more organic. Your choice. It isn't etched in stone but that is how I do it. A table spoon of 10-10-10 fertilizer (in the past) or an organic mix around 5-5-5 (more often now-a-days) deep in the hole and one higher in the hole when I plant. I typically give them a half of gallon to gallon sprinkle of a liquid fertilizer in June to keep them happy. In June/July I do a side dressing which is tossing some fertilizer on the ground about 6 to 8 inches from the stem. I drop a handful. I also give them a big drink of liquid fertilizer. After that, fertilizing isn't done unless the are growing really strong in August. If you are container gardening then I recommend feeding them every 10-14 days with Miracle Gro or the organic like when they are mid size and until they are done producing. Tomatoes are warm weather plants. They need 50 degree nights and 70 degree days to really start growing. But more importantly the soil temperature needs to be 50 degreesish. You don't need to put plants in early before the ground temperatures are ready. Putting a tomato out April 10th doesn't mean it will be bigger than a plant you put on on May 1st come the middle of May. Sure, initially it might look bigger but once the heat hits, tomatoes grow. If it is colder in April your plant is just going to sit there in shiver mode and not really grow. The plant you plant May 1st isn't really at a disadvantage. The bottom line is they will catch up to each other and you don't get fruit any sooner. So wait for the right temperature to plant. But once the temperatures comes, the first one to get them in the ground wins. Two thing can happen with poor watering habits. If your plant gets stressed from too little water and then you soak it, it will develop cracked fruit. If you continually let the ground dry and then over water the plant and let it dry and over water, you'll increase the chances of blossom end rot. Basically, you mess the root system up and the plant can get a calcium deficiency and you end up with blossom end rot. Mulch is your best friend. I use grass clippings. I put down two inches of grass clippings and let it dry out. The next week I put down two more inches and let the clipping dry up and turn brown. I continue this throughout the summer. It is important to let grass clipping dry out before adding more. If you don't, you run the risk of developing smelly grass clippings which creates a bad smelling garden. Water regularly in the morning. I tend to water my plant from the bottom, with a hose, as to not soak the tomato plant leaves or splash mud up. I am always battling blights and mildew. If that isn't a problem in your area, a sprinkler is fine. Tomatoes get quite large. You want to make sure you plant them in the garden so they don't grow up to shade out other plants. If you reach out both arms to the side and pretend the length of your arms is your garden, you can figure out where to plant the tomatoes. If the sun is mostly where your left hand is then you need to plant the tomatoes way down by your right hand. Get it? Sun mostly to the left of the garden will cause or cast shade to the right side of the plants. Sun to the right of the garden will cause or cast shade to the left side of plants. When in doubt go stand in your garden plot around 2 pm. Pretend your a tomato plant and see which way your shadow falls. I use raised beds and plant my tomatoes, so the shade they produce mostly falls outside the box. 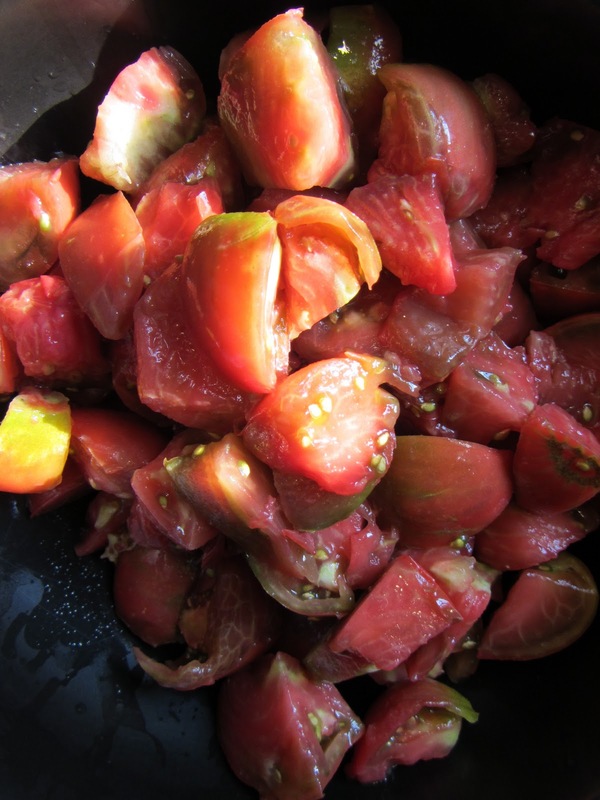 Tomato Thing Ten: What the Tomato is VFF or VFTA? I know that isn't a great answer but they stand for disease resistances. If you don't run into tomato diseases then it doesn't really matter. Unless of course they come up with a tomato that is resistant to early and late blight. So far no luck. Many us buy tomatoes from the garden shops and they usually stock the standard varieties that have these resistances. You will see it on the lablel. 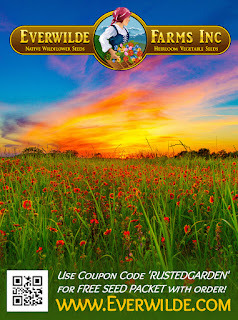 If you are buying seeds from catalogs the catalogs will tell you what the letters stand for. Fusarium and verticillum wilts. It is important to know what tomato diseases your State has. An internet search should help. If you love tomatoes then you'll agree there is just never enough room to plant all the tomatoes you want. Even if you expand your garden year after year, there seems to be a need for more space. There is always that variety you haven't tried but it's right there within your reach at your local nursery or in a seed catalog. You wonder if you could squeeze it in. You think you could possibly negotiate another garden bed from your wife. You ponder what you can trade her for a little more space. If you are like me - you buy it and worry about the space later. Remember, 2 plants is plenty of tomatoes for one adult. I can say it. I can write it, but I don't think I can come to terms with it. A family of four and a garden of forty plus plants last year... I know I can get in fifty this year. Enjoy! I love the idea of cooking over fire. I love camping with a huge fire put but don't have the place or time to get one going in my backyard. I saw these rocket stoves and thought they were very cool but wasn't sure how often I would use one. As I pulled out some frozen tomato sauce from the summer garden, it dawned on me. I could get fire roasted flavor on my tomatoes, peppers and other garden vegetables by using a rocket stove. They are easy to build, move and fire up. A wood fire taste in a few minutes. It will only cost about twenty to thirty dollars to build the rocket stove in the picture. If you have access to free bricks it will even be cheaper. Use what you have around the house too to save money. The video details every step and goes over the parts but the cost break down is as follows. 30 Red Bricks .50 - .90 cents each. And one more older poem inspired by the work of William Carlos William and The Red Wheelbarrow. My goal was to visually create a walk in a garden that one might see, feel and maybe even taste and smell. From the aged gray – black iron ringed rain barrel. The one filled with a cool night’s country rain. By the climbing rose and creeping red dianthus. Just past the clusters of mint and lemon balm. The rain barrel stands with the daffodils and irises. And watch your feet – the barrel is full from the night. I find peace in the garden as I think most of us do. I could give you a 100 reasons from the warmth of the sun to the smell of healthy earth. I write a lot poetry and even paint abstract art. Often, a lot of it is inspired from the garden and associated activities. I wanted to share a poem I wrote this morning. I was thinking about what video I might do this weekend and felt more inspired to write. Poetry comes in waves for me... I think I am inspired to write a book of garden poetry. So here is the first poem. I get asked all the time... When should I water my vegetable seed starts or How often should I water my transplants or How do I know I need to water my indoor seedlings? All very good questions. I also get asked all the time... What is the best way to water my vegetable plants I am growing indoors or Should I use a humidity dome on my germinating seeds? Again great questions. So... I made a vegetable garden video that focuses only on watering your plants from the bottom. A practice I have been doing for 10-15 years. The reason I water my plants from the bottom is that it saves me a ton of time and it really prevents the spread of disease. If you water from the top, you are wetting the leaves of your plant, splashing starting mix around and the stream of water might knock seeds out of the tray or even damage fragile seedling. Oh... and I don't use humidity domes. I find 99% of seeds don't need them and they create a humid environment that fungi love to grow in. I really recommend bottom watering. It is easy and it makes sense. A Quick but Comprehensive Guide to Starting Vegetable Seeds Indoors: Lights, Starting Mixes, Watering, Germination, Feeding and Transplanting! Lights, Starting Mixes, Watering, Germination, Feeding and Transplanting! The best way to get an early jump on the gardening season and save money is to start your own vegetables indoors. It is really easy once you understand a few principles. You can get vegetables to your table a good 4 weeks before seeds planted directly in your garden would be ready. The goal is to grow healthy indoor transplants to size, but not too large, while you still have frost and cold outdoors. The timing should be frost free or warm nights arriving when your indoor vegetable plants reach transplant size. And don't worry you have a lot of leeway. I get asked this question all the time and my answer for 2015 is 14-16 hours of grow light with bulbs that sit about 1-2 inches above your seeds or plant seedling leaves. Bulbs vary, so pay attention to heat coming from the bulb so you don't damage your plants. If you don't have enough intense light, your plants will become what we call 'leggy'. They will be tall and spindly and they are basically putting all their energy in stretching to the light, instead of growing strong and stocky. 'Leggy' plants make for poor transplants. Once your plants are established, lighting is more forgiving. I also get asked if you can start seeds on a windowsill. My answer is NO unless you absolutely have a south facing window that gets full DIRECT sun for 8-10 hours. If you don't have this intensity of sun, your plants again will become 'leggy'. You have to be able to look out and see the actual sun from the window. Here are some videos that explain lighting and tell you what type of bulbs to buy. Incandescent bulbs got to hot. You don't need special grow light bulbs. They are no better than what I describe and they will cost you more money. You can mount them in closets, create grow light stations or even use storage totes to build grow light boxes. I recommend you start small and give it a try. You will be surprised at how easy it is. You can find a lot more videos on vegetable plant lighting and designs by searching my YouTube Channel. You will notice I vary my starting mixes in different videos which is really due to just trying new things season to season or finding products on sale. There is no perfect mix or exact recipe. You do not need to spend a lot of money on mixes. 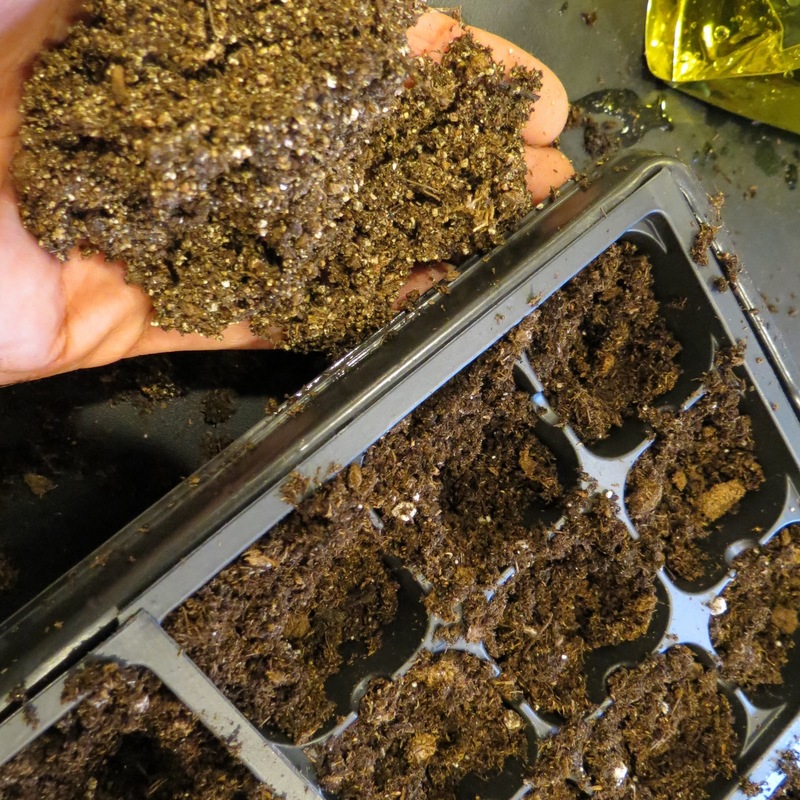 The key to starting seeds indoors is that the starting mix needs to be sterile. Never bring in soil from outside. You will be bringing in bugs, fungus, disease and disappointment. You can buy starting mixes that are sterile at most do-it-yourself stores, Walmart and nurseries. Check around and see how prices vary. I make my starting mixes out of perlite, peat moss, vermiculite and other things at times. It is much cheaper to buy things in bulk and make mixes yourself. This year I am using coco core that I purchased in 250 gram bricks. I add hot water and have enough material to fill a full 72 cell seed starting tray. Here are some videos that provide in depth details for using starting mixes and setting up you seed starting cells. Always thumb pack the medium into the cells. You want a firm planting base for your seeds. I am often asked how often do you water your seed starts and the answer really is when they need it. Too many factors come into play that don't make it possible to say when and how often. But the guideline is less when seeds are starting and more when the plants are bigger. The tip I have is to look at your starting mix and notice the color when it is dry. This is typically how it looks out of the package. When the top of your seed cells turn that color... you are ready to bottom water your seed starts or transplants. The top of the starting mix will always dry first. Watering from the bottom is the best method for 3 key reasons. 1) It will save you a lot of time. 2) You won't splash starting mix and seeds out of the starting cells. 3) You will greatly - greatly reduce the risk of spreading diseases like the dreaded 'Damping Off Disease'. A disease where a cotton like fungus grows on the stems of you sprouts and kills them. For that reason of diseases I also don't recommend using humidity domes. A lot of people do and don't have issues. Very few seeds need to be germinated in a humidity dome. The domes create a perfect environment for diseases and fungus to grow. Here are some videos that show you how mold and fungus grow, for fun and my basic water method. If you aren't growing in seed sells make sure there are holes in the bottom of your starting containers and just sit them in foil cooking trays. You can bottom water that way. What every water is not absorb after 30 minutes, just pour out. Promote Fungus & Mold Growth? Seeds germinate at different rates. Some will germinate in under a week and others can take up to four weeks. You can find that information on the seed packet. Basically just follow the instructions on the seed packets timing and planting depth. Generally speaking the temperature should be in the 70's (Fahrenheit) for germination. You can purchase a heating mat if the area you are using isn't getting into the 70's. I have tomato varieties that need high 80's for good germination but in general you want a 70+ degree seed starting area. Remember the lights will add heat to your germinating seeds. Feeding your vegetable transplants starts when they get their first set of true leaves or about a week thereafter. That is typically the second set of leaves that form after germination. A seedling will initially use the seed coat itself for food. After that, I recommend using a liquid fertilizer at 1/2 strength or less when you water your plants. I recommend a synthetic fertilizer indoors for the sake they smell less and are less likely to promote unwanted fungus growth. Think fish fertilizer, beet extract or other organic fertilizers that not only feed your plants but create a friendly food source for fungi and bugs. This is 100% my opinion but, what every you choose, use a liquid fertilizer. You can also initially throw in a granule type fertilizer into the starting mix when you are preparing it for starting your seeds. Again, use a lot less in the starting mix. More harm can come from over doing it with fertilizers. First Leaves or True Tomato Leaves, What are They? At some point you will need to move your seedlings into larger cups. This all really depends on what you are growing and when you started them. The key for starting seeds indoors is to grow a nice size healthy transplant that hasn't sat in the house too long. You don't want your plants to be flowering indoors. If that should happen, remove the flowers. You need to time your seed starts, so they can go outside when the conditions are right. That is typically after the last frost date in your area. Most seed packets will tell you when to start seeds indoors. The general range for starting most seeds indoors is 6-8 weeks. There are exceptions. Many herbs can be started 10-12 weeks indoors. Squash, cucumber and certain melons should be started 4 weeks indoors. Again the weeks time is based on when they can go outside, free from risk from frost. However, some plants like warm weather, so you need nights that stay if the 50's. If you put a warm weather plant out too soon, it just sits there. Do a search on cool weather crops and warm weather crops and that will help you understand when to start them indoors as to match them with the outdoor conditions they like. Most plants can be started in the small seeds cells, even divided and then moved into cups. Certain seeds, typically bigger seeds, like zucchini, squash, melons and cucumber should be started in bigger containers. They won't need to get transplanted into bigger cups. They can grow to size in their containers and eventually be transplanted directly into the ground. Here are some videos on transplanting tomatoes into larger cups indoors and starting plants in larger containers. There are a lot more videos on my YouTube Channel.